As predicted by Las Vegas odds-makers, the Oak King scored a narrow victory today over his twin brother, the Holly King. The Winter Queen is reportedly in mourning, though she is expected to emerge – as she has since time began – in her guise as the Spring Maiden, on or about February 2, (aka, Imbolc, Candlemas, St. Brighid’s Day) to take her place beside the new reigning monarch. At least that is the story the old Britons told to explain how the darkest day of the year hides the seed of summer, and why the Winter King is likely to win the scheduled rematch on June 21. Though I cannot prove it, I’ve always believed this tale of eternally battling twins must have gone into the making of the black-on-the-left vs. black-on-the-right episode of Star Trek. Is this a real legend – one the Celts and Saxons actually told? 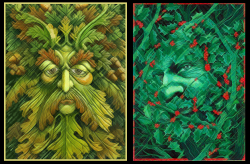 Robert Graves said as much in The White Goddess, suggesting that Balin and Balan, as well as Gawain and the Green Knight represent the eternally dueling pair in Arthurian legend. Sir James Frazer’s earlier Golden Bough had a similar section entitled “The Battle of Summer and Winter,” although he told the story with only one eternally dying and reborn Divine King. 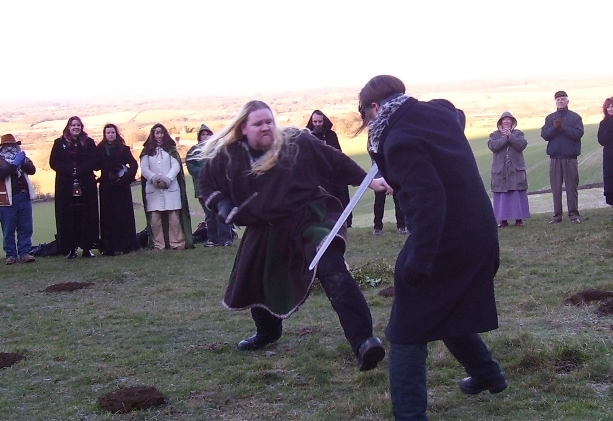 The Oak and Holly kings battle at a 2005 Winter Solstice ritual. Photo by Anderida Gorsedds. Whatever you may think of the story, now that the solstice has arrived, may you stay warm and dry, and bask in the confidence that summer is coming around again. This entry was posted in Myth, oral tradition and tagged holidays, Myth. Bookmark the permalink.